Everything we do at Claytex is about modelling and simulation, in particular the simulation of the dynamics and behaviour of the complete system. With a focus on systems engineering, this covers multiple domains such as vehicle dynamics, powertrain, energy management, thermal management and extends into the virtual testing of ADAS and autonomous vehicles. Claytex is a software distributor, solution developer, consultancy and training provider. We develop simulation solutions using the open standards of Modelica and FMI and distribute systems engineering solutions from Dassault Systemes, rFpro and specialist Modelica library developers. Our portfolio of tools includes Dymola, Reqtify, ControlBuild, rFpro as well as our own software products. rFpro combined with sensor models from Claytex enables the virtual testing and development of ADAS and autonomous vehicle control systems. It allows the controllers and the driver (or occupants) to be immersed into the virtual environment. Injecting traffic, pedestrians, cyclists and other dynamic agents into the virtual world enables complex test scenarios to be simulated. 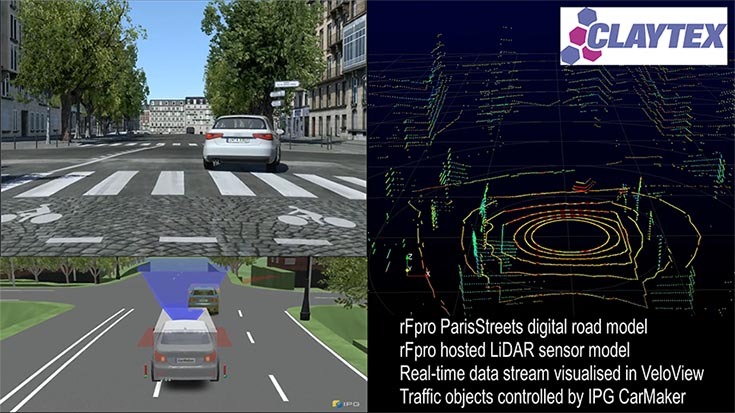 rFpro offers an open API to support a wide range of vehicle models and interfaces to traffic simulation tools. It also supports Hardware-in-the-Loop and Driver-in-the-Loop simulators enabling humans to be involved in the scenarios to introduce random variations. Dymola is a modelling and simulation tool, used by multi-disciplinary teams of engineers to share information and engineer complex systems. Using the open standards of Modelica and FMI, Dymola provides a component orientated, physical approach to modelling that covers multiple domains. Modelica application libraries cover a wide range of industries including automotive, motorsport, energy, buildings, industrial equipment and much more. Dymola also provides full access to the Modelica modelling language allowing you to easily extend from existing models or create your own using an equation based, acausal modelling approach. 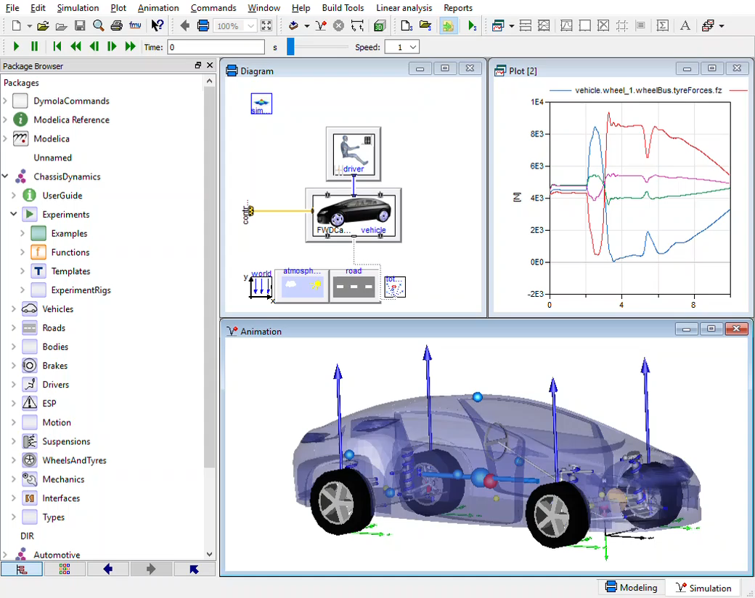 VeSyMA is a suite of Modelica libraries for Vehicle Systems Modelling and Analysis. Focused on automotive and motorsport applications it includes solutions for engine, powertrain and vehicle dynamics modelling and simulation. The libraries are developed by Claytex, using Modelica, and are compatible with Dymola and other Modelica libraries. Electric, hybrid and conventional vehicles can all be modelled with VeSyMA. The models can be used for performance, fuel economy and energy analysis on the desktop as well as more detailed studies such as driveability, ride, handling and thermal management. The models can also be integrated into Driver-in-the-Loop and Hardware-in-the-Loop simulators. Reqtify captures requirements from any source and performs traceability and impact analysis across different systems, programs and project levels covering the complete product life cycle. It has interfaces to 70+ software tools include Microsoft Office, modelling tools, programming languages and requirements management tools. Reqtify automatically extracts data created by your current suite of tools so that you can then perform traceability and impact analysis to identify issues, such as unfilled requirements and carry out impact analysis. 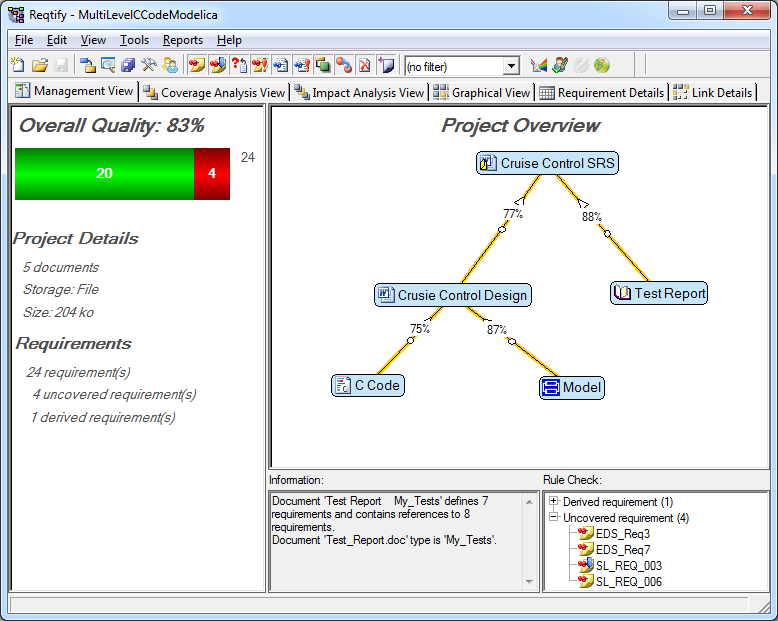 Customisable reports can then be generated from this data to support quality and certification processes. 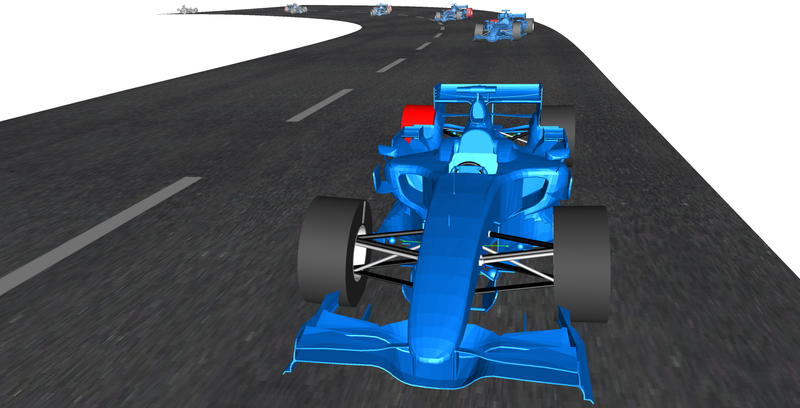 Our solutions for motorsports enable the complete race car to be modelled and simulated in one environment. Using Dymola and VeSyMA we can model the engine, gearbox, driveline, vehicle dynamics, integrate the battery, electric motors and power electronics and include the cooling systems. These solutions are used in Formula 1, NASCAR, IndyCar, Formula E and many other series including Dirt Late Model and sports cars. Different organisations apply the solutions in different ways covering analysis in the design office, integration with trackside tools, laptime prediction and Driver-in-the-Loop simulators. 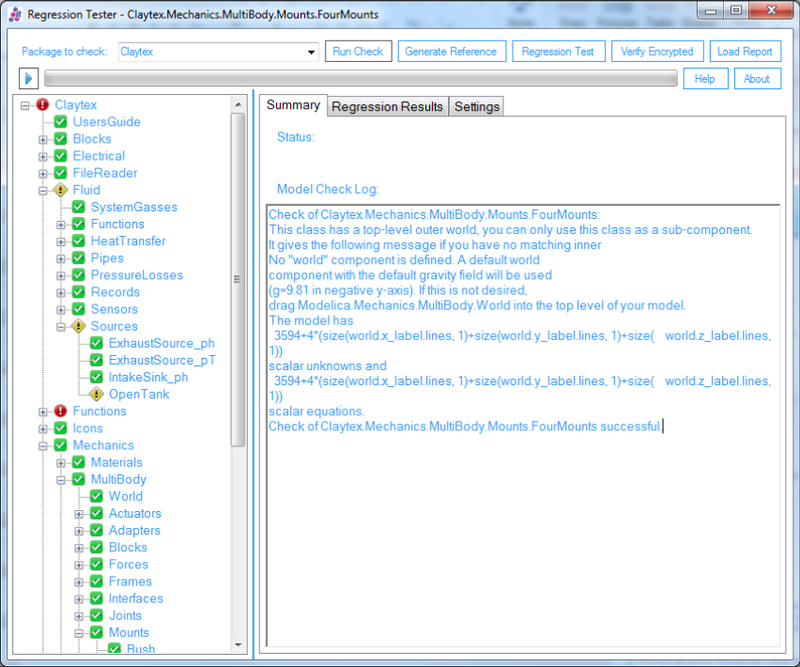 Claytex has a range of tools to support the automated testing of Modelica libraries. Our RegressionTest Tool monitors your revision control repository and automatically runs checks and tests after every commit. For more informal testing and to run large numbers of experiments efficiently we have developed the MultiRun Tool. Both the RegressionTest and MultiRun tools are designed to work with Dymola and will run multiple instances of Dymola in the background to make full use of the multiple CPU cores in your PC. Claytex develops and sells a wide range of Modelica model libraries. These libraries are primarily designed to work with Dymola and cover a broad range of applications and industries. The VeSyMA suite, which is developed by Claytex, is focused on the automotive and motorsport industries. Other solutions from our partners target the modelling of buildings, power plants and aircraft. Claytex offers a range of Modelica and Dymola training courses. The FMI Standard is an open standard for exchanging models between different simulation tools. 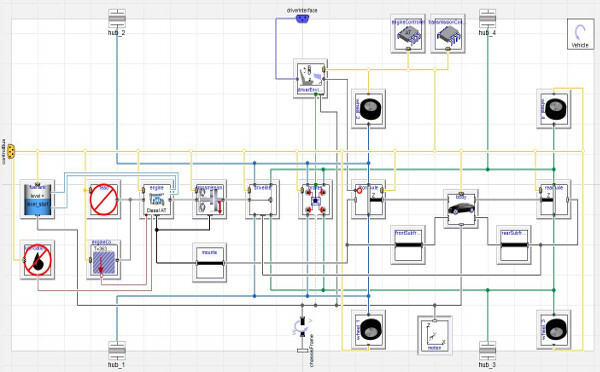 Claytex fully supports this standard and has developed FMI compliant tools for Simulink, Excel, Windows and the Cloud. Our VeSyMA – CloudSim solution is built on the FMI standard and supports running FMU’s in the cloud through a web browser. This enables simulation models to be made available to non-experts in a controlled manner with a user interface that can be tailored to a specific model and analysis process.